It’s easy to forget the object of the game of golf. It’s not perfect mechanics. It’s not 300 yard drives. It’s not money, FedEx points, trophies, or the latest greatest equipment. It’s not handicap indexes to playing from the tips. Every one of these things is a part of today’s golf, but none of them is the object of the game. The object of the game of golf is to get the ball in the hole – in the fewest strokes possible, ideally while having as much fun as possible. Not coincidentally, there is nothing more fun than watching the ball drop in the hole. The farther away one is, the greater the fun. There is so much that goes into achieving that objective, and so much wrapped around it in today’s golf culture, that the point is sometimes lost. I was reminded of the object of the game in a recent conversation with my coach, Scott Baines. I was seeking advice on how to help a friend who wanted to start playing. Scott’s initial response was, “Tell him to get a wedge and putter, and spend the first year learning how to get the ball in the hole.” His statement surprised me into awareness of memories of how I learned the game. The first club I picked up as an 8-year old was a putter. My dad took me to the putting green and taught me to get the ball in the hole. As I improved, we had putting contests. The next club I got was a sawed-off 9 iron. He took me to the course when he played with my grandfather. I got to drop my ball 50 yards from the green and play it all the way into the hole. The more competent I became, the more clubs I got and the farther out I got to start. By the time my parents set up my first lesson, I already knew well the object of the game – I had been getting the ball in the hole for years. To reinforce the premium on short shots, my caddie friends and I set up chipping courses at our homes and at the club, and we played with every free moment. Whiffle balls, tennis balls, golf balls, it didn’t matter. We had our clubs out and we were playing mini matches practicing getting the ball in the hole. My sons are 4 and 12, and I am teaching them the game the same way. We hit the links at the local putt putt courses every chance we get. We celebrate holes-in-one with a “booty dance”. 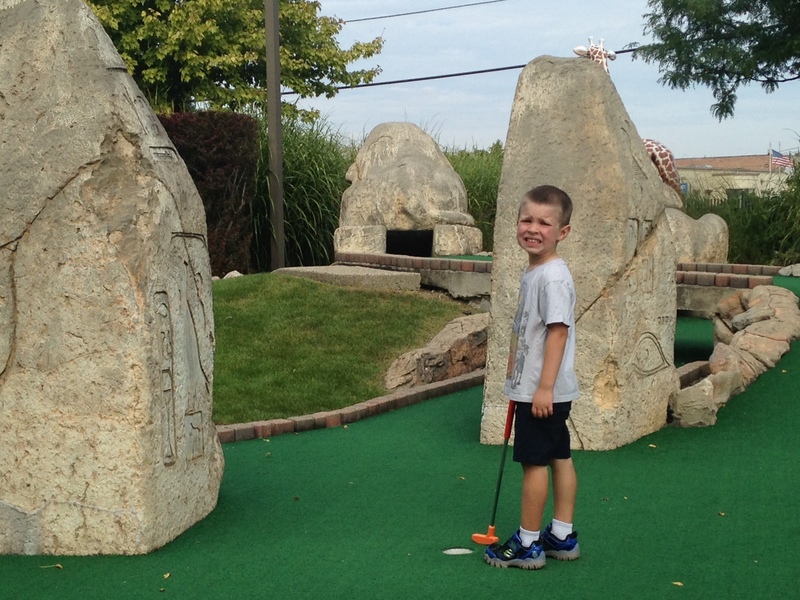 My little guy exclaims “Win!” after every putt is made, regardless of the total score. We don’t correct him, because in the purest sense, he is right. We took a further step one day when I came out of the house to find them chipping around the front yard. Deciding that it was time for them to discover the wonder that is a chipping course, I installed a hole in the corner of the yard (using the cup from my wife’s immersion blender – oops). We can be found out there most evenings getting in 9 or 18, or more. Always, the ball goes into the hole before moving on to the next one, and we give kudos for every made shot. In these small ways, my boys are learning the joy of the game. The Shorty’s course is a practice course laid out by David McLay Kidd within the practice area. It is comprised of nine par 3s. It is a place to go “play around”, have fun and get warmed up for the golf ahead by getting accustomed to holing shots on the Bandon terrain. And if one sneaks out to Shorty’s late in the day, cross-country golf is also a max-fun option. No set par for a hole, just pick a green and the person with the lowest score wins. The Punchbowl is an enormous, undulating putting course designed by Tom Doak and Jim Urbina. Even as a kid, I doubt that I could have dreamt up a golf adventure that was more fun (and I spent many an hour doodling and trying). Bandon Preserve is a thirteen hole par 3 course designed by Bill Coore & Ben Crenshaw. Playing this course was by far the most fun I had at Bandon (in spite of the fact that I played well to shoot 72, 74, 74, 76 on the “Big 4”), and it might have been my favorite course. Plenty of challenge, but not too hard that an average player can’t meet the objective of getting the ball in the hole in a reasonable number of strokes. When I am asked about Bandon Dunes Resort, I give the 4 courses glowing reviews – they deserve the accolades. But what really sets Bandon apart, I tell my questioners, are the “Little 3”. They are unique (for now), and they maximize the joy of the Bandon experience by bringing golf back down to its basics. When they are older, if they are still playing the game, I will take my boys to Bandon Dunes. I will take them not just because of the courses – there are great courses all over of the country, and the world. I will take them because Bandon knows how to maximize fun for its guests. And I know that, when we go, my boys will be ready to take on Bandon’s challenges because they are learning well how to achieve golf’s primary objective – get the ball in the hole, and have fun while you’re at it. Categories: golf, golf industry | Tags: bandon dunes resort, golf, punchbowl | Permalink. A slip of the mind, and it slipped through my fingers. I’m standing on the 17th tee at Kingsley Club, with one of my biggest golf goals in hand – I am 1-under and just two holes away from breaking par for the first time since I was 18. The thought of achieving that milestone, as well as telling my coach about it, crossed my mind and lingered for a moment. Part of me knew that it was a bad idea to be entertaining those thoughts as I stood behind the ball to select a target, but I could not help it. “Stay in the moment and play just this shot,” I told myself. It was too late though – the damage had been done. A double bogey later, followed by a par at 18, and I finished +1. Breaking par would have to wait. I should have known better. Not because I have received the coaching, or read the books about the mental side of the game. I should have known better because, earlier in that same round, the golf Gods fired a warning shot across my bow. After solidly making birdie on the first two holes, my brain temporarily went on TILT with the possibilities. I completely lost track of where I was in the moment and made an ugly double on 3. Slap in the face. Back to the reality of the work at hand. Jack was well-known for getting into that mental zone, as have all of golf’s greatest champions. Even so, he describes earlier in his memoir the difficulties he had with thinking too far ahead about his quest to complete the modern Grand Slam, and how that projection into the future cost him. It would appear that even those with the “greatest inherent gifts” still have to consciously wrestle with the chaotic beast between their ears at times. A comforting realization that, along with the experience I gained at Kingsley, makes me much more likely to bring that under-par round all the way home soon. Categories: golf, golf instruction, Kingsley Club | Tags: golf, Jack Nicklaus, Kingsley Club | Permalink. Standing on the 16th green at Old Elm Club, looking back down the long, rolling fairway with the sunlight filtering through the trees, I remembered why I loved this game so much. I had been invited by my good friend Brian to join him at Old Elm even though I wasn’t really playing golf at the time. He needed a fourth, and he knew that I grew up caddying and playing this marvelous little Donald Ross course in the north shore suburbs of Chicago. An interesting and kind invite, especially given that I had essentially quit playing golf with any regularity for the previous twenty years. Perhaps he knew something that I did not. Perhaps he had an inkling that seeing those familiar fairways and greens would rekindle my passion for the game. A passion that I had talked myself into believing was long ago dead. The story that I would tell people if they asked me why I didn’t play anymore was that I had competed as a kid and had become burned out. I failed in my attempt to make the team at University of Illinois, and ditched the clubs for a full college life. After graduation, I didn’t have many potential playing partners in my inner circle, and so the opportunities did not arise. That was the story I told, and there was some truth to it. The deeper truth though is that I just put the clubs down one day and inertia took over. Thankfully, on that day several years ago, Brian’s invitation changed my direction. Looking back now, I realize how fortunate I was to have had the opportunity to caddie at Old Elm. Each day, I got to act as a guide, cheerleader, coach, and comrade to some of the country’s highest powered executives. Perhaps I will share some of the words of wisdom, and the funny stories, of looping around the course in their company in later posts. For now, I’ll just share that I witnessed every brand and quality of golf imaginable, absorbing as much as I could along the way. We were allowed to play each evening and all day Mondays on this immaculate course created by a master designer. These were times with friends that contained equal parts joy, challenge, competition and serenity. I have putted out on the final hole in the dark at Old Elm more times than I can remember. That place is dear to my heart. It has its own special magic for me. Brian and our other two playing partners (Peter and Dan) helped me reconnect with that magic again that day, and it has had me ever since. In the the past 2 years, I have travelled coast to coast playing world-class courses, started working with a coach, and joined the Kingsley Club in Michigan. I have found the joy, challenge, competition and serenity once more, and I can’t get enough. I am truly geeked on golf. I invite you in to phase two in my journey with this game, and I hope you share with me as well. After all, golf-geeking is always more fun in a group. Categories: caddying, golf, golf courses, Kingsley Club | Tags: caddie, golf, Kingsley Club, Old Elm Club | Permalink.